6. KalDer Bursa International Cartoon Contest is over. 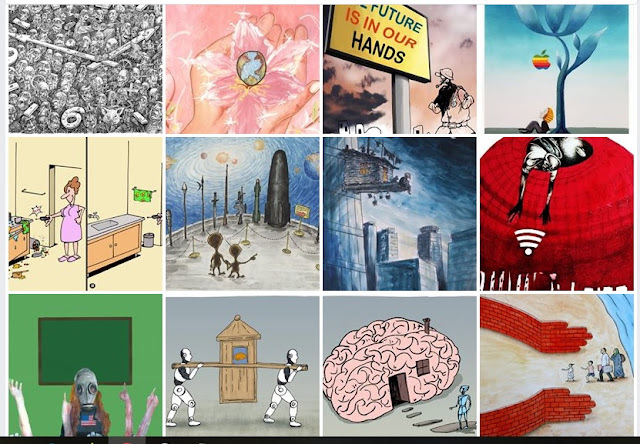 The contest which was “The Future in our Hands” themed collected 900 cartoons, from 57 countries by 379 artists. Despite the though theme, artists showed their profession, skillfully. A pre-meeting was done to select the finalist by the jury members. There are 110 Cartoons in final stage. The cartoons that are on final stage will be exhibited on KalDer Bursa facebook page between 21 and 31 of january. For the objection application about plagiarism or etc, you can send an e-mail to bursa@kalder.org with the exact cartoon number. Thanks to all competitors.